A little-known fact, Tigrilla’s nickname as a child was cotorra, which means parrot in Spanish. As a baby in her crib, she scared the living daylights out of her mother one night when she heard talking through the baby-monitor and thought someone was in the room. When she ran in there, she discovered that Tigrilla was having a full conversation with herself! For the reason you can easily see, being a public and keynote speaker was her destiny. Tigrilla uses her love of speaking, analytical mind and connection to the plant world to inspire thought and action. 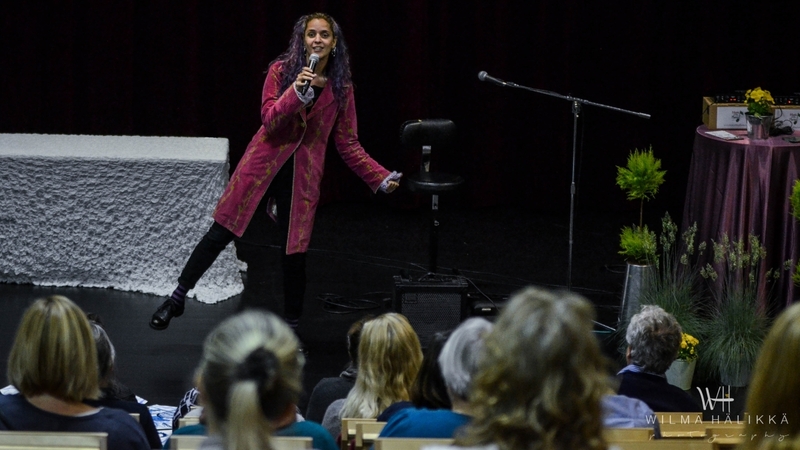 As a philosopher, visionary, and public speaker, she has spoken in front of intimate groups and conference audiences in more than twenty countries around the world. Integrating her vast experience, she invites you to look to the proven track record of the plant world to learn how to create healthy, connected and sustainable lives and solve problems in an ever-evolving world. Lots of people talk about ‘greening’ their lifestyle and ‘getting back to nature.’ But have you ever thought about this from nature’s perspective? The plant world has never lost its connection with us. We humans are the ones who are culpable for the great disconnect between our species. Due to our desire to dominate the plant world instead of co-exist, we have missed out on the opportunity to from them. We constantly hear about the need to reverse climate change and modify our existing food chain, but what if we are looking at the problem all wrong? More than looking at the problem wrong, what if we are asking the wrong question to the wrong person? Tigrilla takes you through unexpected ground to understand that the key to our continued evolution and happiness lies with those that have been adapting to this planet’s needs since the beginning of time: the plant world. If we listen, plant intelligence holds the answers to sustainable adaptability. What would happen if we were to give a plant the ability to interact with us in a way that we could understand? This is what a team of researchers set out to discover in the 1970s. They experimented with plants that open doors and gave them driver’s licenses. As a result of 40 years of exploration into plant perception, a device that enables plants and trees to play music was developed! Interacting with a variety of stimuli, artists and observers in diverse environments, plants learn how to create melody and harmony. What we didn’t expect was what came next–most noteworthy, the effects of plant music on humans. In this sonic and interactive talk, Tigrilla takes you through the research into plant cognition and gives you a glimpse into the audible world of interspecies musicians. Once upon a time, all food was organic and nature was an integral part of our lives. But somewhere along the way, we lost our ability to communicate with trees and plants. Deforestation, species evolution, pollution and the insatiable human hunger for more land create large chasms between “our” world and “theirs”, bringing about a separation where once there was none. Cities offer the greatest opportunity for social co-operation. Time and time again we see that the connection to and sustainable use of nature in our cities contribute to the improved health of our society. They reduce costs by improving human health, sequestering carbon, and purifying our water. Even more, they enhance the well-being of people and communities by providing recreational experiences, tranquility and fine views, while maintaining a livable environment by regulating climate, air quality, soils and water cycles. So how do we move co-habitation with the plant world to co-creation? Whether you are looking at a local, global or business landscape, Tigrilla can deliver a new vision sure to spark creative change. Contact her for your next event! If I am to bring your research and art to the main stages and public discussions, I need to be able to get there on my own….